And now, for something completely different (which isn’t quite accurate, as we will still be dealing with STEAM principles, and libraries, so it would probably be more accurate to say, something somewhat different). Rube Goldberg was an American cartoonist, engineer, and inventor, who is best known for his illustrations of simple actions being carried out by crazy machinations. 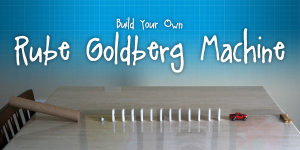 Today, many individuals have built Goldberg-inspired contraptions in real-life, and there is even an annual competition. Libraries are often looking for programs that have the most bang for the smallest buck, and a Rube Goldberg machine can be simply built from anything, by anyone, for any purpose, and they encourage 21st century skills like design thinking, problem solving, and teamwork. I found a quick post that gives some ideas to get started (using dominoes, paper towel rolls, and marbles), and I’ve also included some videos for ideas and inspiration. If you would like other ideas for low-tech making, I have a Pinterest board you might be interested in too. Catch ’em at the Library!